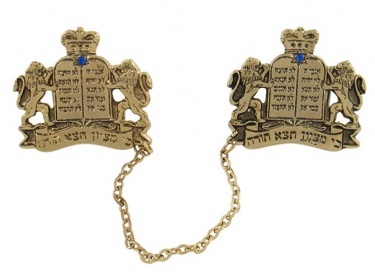 These tallit clips look wonderful while holding your tallit together during services. Made by Peninat Hakasef in Isreal. Featuring the 10 commandments with a lion on each side. On the top of the 10 commandments is a blue stone. Each piece measures 1-5/8" x 1-3/8", the chain is 4.5" long.